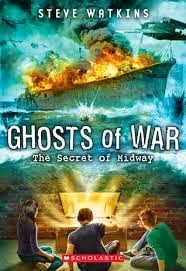 Ghosts of War: The Secret of Midway, by Steve Watkins (Scholastic, December 2014, middle grade) is ghost story with bonus exciting history lesson, so much so that instead of leaving the book at my mother's as planned I am going to take it back home and try to get my picky 14 year old history buff to read it. Always eager to become more educated through pleasure reading, I truly appreciated the history contained in this story--I'd only had a vague impression of the Battle of Midway before, but now I know so much more about it's importance, and the sadness of it. William's story didn't have a happy ending (he's a ghost, after all), and it's fascinating to find out just what happened to him. The balance of historical detection and real world issues (the bully at school, Steve's borderline abusive dad, Anderson's mom having MS, Julie becoming less prickly) is well done. I also appreciated the fact that solving the mystery meant asking men and women who were actually alive back then what had happened, and listening to their stories--it's nice to see the experiences of older generations appreciated. And a final thing I appreciated was that the tone of the book was not anti-Japan--for instance, Julie's dad is Japanese, and through her family back there they are able to hear from a Japanese officer expressing regret for the last bit of William's sad story. So in any event, like I said, I'll be offering it to my distressingly difficult reader--it's fairly short (191 pages) and it's a fast read, and I think he'll enjoy the combination of ghost, mystery, and history. I haven't heard of this, but it sounds good. I like that the older generations are involved in the story.